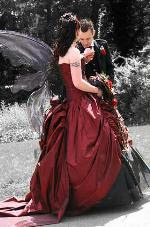 Are you considering planning a Gothic Wedding or wearing a Gothic Wedding Gown? Gothic wedding gowns do not have to be black. In fact, because you are designing a gothic theme for your wedding ceremony, so much of the rest of the decor is likely to be black that you will actually want something a little bit different to jump out. Black, purple and deep deep red red are the classical colours that most people associate with gothic clothing and you'll most likely want your groom to dress in black with blood-red trim. A black velvet-effect waistcoat with bone clasps over a white or red ruffed shirt may look impressive. For you as the bride, remember that in time-honoured 19th-century gothic literature the story was always the perfect and innocent young lady with a passionate streak who was seduced by or sacrificed to the dark master of the castle with the bite on the neck that drew blood. It can be very provocative and visually beautiful to duplicate this at your nuptials with a sensual Victorian-style white or off-white gothic wedding gown. Pick out one with flowing long sleeves, a high neck and lots of lace and tulle for the full sacrificial impression. Gothic themed wedding ceremonies are frequently booked in wintertime or close to Halloween, so you can expect that it won't be excessively hot, particularly as night time approaches. For the evening, if you're changing out of your gothic wedding gown, you might want to choose a Morticia-style black satin gown with hanging sleeves, or a medieval-style dresses in purple or red. Or how about a gothic boned corset in black or deep red? It fits the theme for you and your groom to be dressed alike now that you are married, and you can change your make-up and hairdo to give you that vampish look. Your jewellery will be all important as well. This is one facet of your costume that can carry-over from the daytime into the evening, and if you pick out darkside jewelry that will go well with both wedding gowns you can create a link that also has a deep symbolic sensual meaning. Slave or maille bangles and choker necklaces are ideal and will put the finishing touches on your wedding day look. Among the best things about wearing gothic wedding gowns is that your photos will be impressive, so take the time to make the most of that by considering how your dress or dresses will look beside your groom's outfit so that the two of you make the most of every similarity and contrast that you have. Individuality is the key here and you will find a lot of ideas are triggered by all of the gothic wedding dresses that you will find on the internet. When you are planning your wedding it can help to keep a scrapbook and fill this with ideas as you come across them. This will help to make it easier to visualize your wedding day and gothic theme.